The boyfriend and I used to love spaghetti and meatballs. A nice full flavored tomato sauce, gorgeous herbed meatballs, a litlle crispy on the outside and soft on the inside, on top of a pile of al dente spaghetti. Lovely! But, of course these days there's no more spaghetti for us. I can't really say that I miss it, but just some sauce coverd meatballs seems a little, oh I don't know, unsatisfying I guess. Of course the best part of the spaghetti and meatballs, really where the meatballs. And the sauce. So we needed a pile of something different underneath it. We tried zucchini, in long thin slices. It was okay, but it goes soft really fast. If you heat it, even for a few seconds, it softens right away and becomes a little mushy. I read a lot of recipes using spaghetti squash, but here in the Netherlands, that squash is not available. At least, not to my knowledge. I'll try to grow them myself next year, but untill then, I have to find something else to satisfy my fake spaghetti craving. Mix all the ingredients together and roll in to balls. Put a little oil in a frying pan and fry the meatballs, for about a minute or two/three on high heat. Lower heat and let them cook untill they're done. That takes about twenty minutes. Put all the ingredients in a sauce pan and put on very low heat. Let it simmer for about an hour, stirring every now and then. The long and slow simmer really combines all the flavors well and it reduces the sauce which brings out even more flavor. When it's done simmering, pour in a blender or use a stick blender to puree the sauce. Cut about 1 pound (450 gr) of white cabbage into thin strips. You can cook for a minute or three until just tender, but I chose to sautee in a knob of butter and a sprinkle of salt. It has obviously more flavor then just boiling in water. It takes around three minutes of sauteeing on medium heat, for the cabbage to get soft, but still a little crunchy. If you don't like the "bite", just cook them a little longer. It all may seem like a lot of work, but it's really worth the effort. 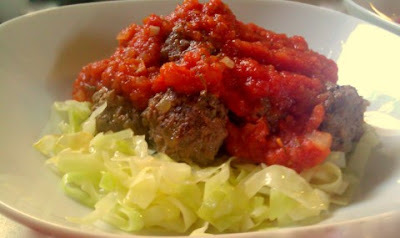 The sauce is incredible, the meatballs have loads of flavor and the combination with the cabbage really worked well. If you give this a try, please let me know how it was! Excellent idea. I've recently been using carrot and zucchini strips to replace pasta. When I think about it, something like spaghetti really didn't have much flavor to it at all. It was just the lifelong association of SPAGHETTI and meatballs that I had to get rid of. I would love to use spaghetti squash, but the problem is, that I can't get any in my country. Apparently we are not the squash/pumpkin kind of people...only one or two varieties are sold, and not even at every supermarket. I'll try to grow some myself :-) But thanks for your comment!